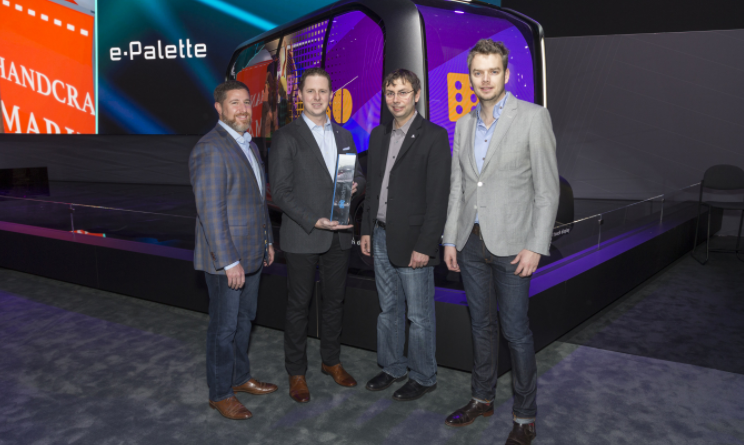 Car shopping and information platform, Edmunds and the Consumer Technology Association, producer of CES 2018, the global stage for innovation, today awarded the inaugural 2018 Edmunds CES Tech Driven Hackomotive Award to the Toyota e-Palette Concept Vehicle. The Hackomotive Award recognizes the most innovative, transformative automotive concept or technology unveiled or announced during the show. The Toyota e-Palette Concept will be a fully autonomous battery electric vehicle with next-generation sensors and software to safely deliver passengers, goods and services for a wide variety of applications. It will also feature an open-source control interface so that announced partners such as Amazon, Pizza Hut, Uber and DiDi can customize to their own specifications and needs. Toyota plans to have a fleet of e-Palettes operational for the 2020 Olympic and Paralympic Games in Tokyo — which Edmunds editors recognized as an impressive timeline that underscores Toyota’s commitment to a more autonomous future. The 2018 Edmunds CES Tech Driven Awards program honors the new vehicles, systems and concepts from automakers represented at CES 2018. Previously announced winners include Audi in the Most Innovative Automaker and Most Innovative Infotainment System categories; Honda in the Most Innovative Car and SUV categories; Porsche in the Most Innovative Driver Assist Feature category; and Ford in the Most Innovative Truck category. The Hackomotive Award was selected onsite by a panel of Edmunds editors from the pool of automotive technologies announced at CES. Criteria factored into the decision included feasibility and potential impact on the industry; usability and practicality of the technology; and overall ingenuity. If CES were a self-contained auto show, it would stand as the fifth-largest stand-alone auto show in the U.S. For more information from the Edmunds expert editors about each of the winners, visit www.edmunds.com/car-awards/ces-techdriven/.